Update: Italy's insolvent bank du jour, Banca Carige which was halted on Monday due to events profiled earlier (see below) has gotten a last minute lifeline, and after it was unable to raise €400MM in capital in the bond market, it received a €320MM liquidity injection from Italy's Interbank fund, which plans to purchase €320m of Carige bonds. According to a statement by Premier Giuseppe Conte, the injection "ensures compliance with the capital requirements" and adds that the aid "sets the conditions for the rapid completion of the planned capital increase and provides the new management of the bank with the conditions for the development of suitable industrial strategies, including the assessment of possible business combinations." In other words, Italy's incipient banking crisis has been postponed for the foreseeable future. Remember the Italian "doom loop"? Two months ago we reported that during the first Italian bond market freakout this May over the ascent of the populist due of Salvini-Di Maio to the Italian throne, Italian bank holdings of domestic government bonds rose by a record €28.4bn, more than what was seen during the peak of the European sovereign debt crisis of 2012. Visually, this is what the single biggest month of Italian bank purchases of BTPs in history looked like. This vicious circle of Country X banks (in this case Italy) buying Country X bonds during times of stress - with the ECB's trusty backstop - had for years been Europe's dreaded sovereign bank doom loop. And, as Italy clearly demonstrated, repeated and aggressive attempts by European regulators and policymakers to finally break the "doom loop", most recently with the introduction of the 2014 BRRD directive, which sought to remove the need for and possibility of bank bailouts, and instead ushered in bail ins, had been an abject failure. 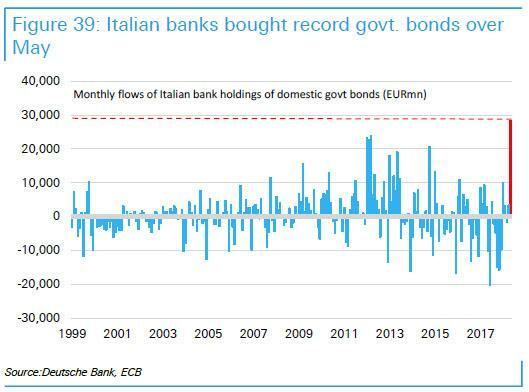 On Monday traders got a harsh reminder of this when Italian banks came under renewed market focus, and selling, due to their inflated holdings of the country's government bonds whose value has tumbled since May - just as they doubled down on their BTP purchases. This time, the epicenter of the bank rout was Banca Carige, Italy’s last remaining large problem bank; weakened by years of mismanagement and shareholder infighting, it has fallen behind in the restructuring process that has seen rivals shed bad debts in the past two years. And according to Reuters, healthy Italian banks will be needed to help fill a €400 million hole on Banca Carige's balance sheet "in order to avert a possible crisis that would further destabilize the sector." The reason for this funding deficiency: Carige has failed twice this year to issue subordinated debt due to the high yields demanded by investors, even as the ECB has given it until Nov. 30 to detail how it will fill its capital gap before the end of the year. And with institutional funding markets closed to all but the strongest lenders, Italian banks would take up the bulk of a €400 million euro subordinated bond Carige plans to issue to quickly replenish its second-tier capital, Reuters reported. If this sounds like taking the doom loop and squaring it, where semi-healthy Italian banks - already loaded to the gills with BTPs - have to fund the bailout of semi-insolvent banks which have succumbed to the doom loop, it's because that's precisely what is going on. Additionally, the bank’s leading shareholders are also expected to pitch in in this latest mini bailout. The restructuring process will then see Carige launch a new share issue in coming months to repay the bond, one of the sources said. The banks that bought the bond will convert the debt into equity by taking on unsold shares, with a view to eventually liquidating their holdings, the source added. The process will be carried out through a section of Italy’s depositors’ guarantee fund dubbed ‘Voluntary Scheme’, to which all the main banks contribute on a "voluntary" basis to avoid falling foul of European state aid rules. Members of the ‘Voluntary Scheme’ were due to meet at 1100 GMT on Monday to approve the intervention, a Reuters source said. 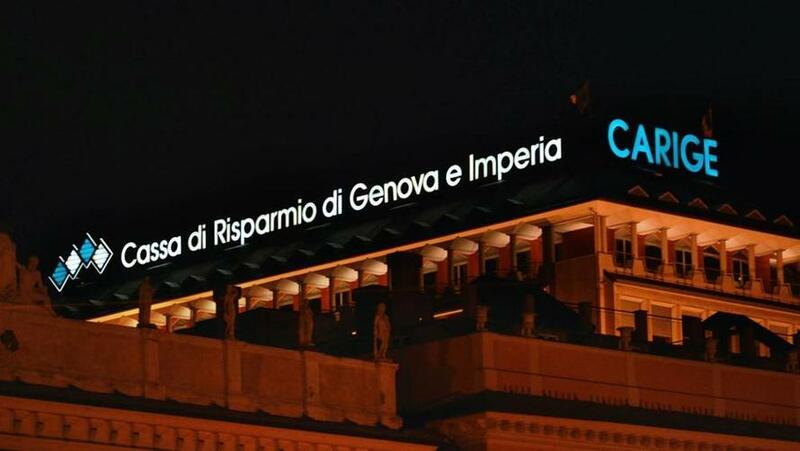 But while the emergency funds may paper over Carige's liquidity shortfall, its solvency remains very much in doubt: based in the port city of Genoa, Carige is heavily exposed to the economy of the northwestern Liguria region, which has been gripped by a deep recession. A global slump in the shipping industry have dealt harsh blows to the local economy, which is now also grappling with the fallout from the deadly collapse of a Genoa bridge that severed the port’s main artery to Europe. Carige last raised funds in December 2017, when it resorted to asset sales to push through its third cash call since 2014. It has raised a total of €2.2 euros in capital in the past four years. It has not been enough. Further complicating matters, Carige has been through a series of management changes because its top shareholder, local businessman Vittorio Malacalza, has pushed out three chief executives in as many years. Malacalza in September won a boardroom battle and appointed former UBS banker Fabio Innocenzi as chief executive. Carige has also hired UBS as adviser - in what some may say reeks of a conflict of interest - to assess a possible merger, which bankers have said in the past was made difficult by the bank’s capital and restructuring needs and its bickering shareholders. Carige’s shares and bonds were suspended from trading on Monday pending the bank’s announcement after closing on Friday at an all time low. Meanwhile, Italian 10Y bond yields spiked as high as 3.45%, matching the highest levels of November if still some 35 bps shy of the recent highs hit in mid-October. And, in the most troubling market move of the day, the euro has tumbled to fresh 16 month lows as traders increasingly expect Europe's political turmoil(s) - whether Brexit, Italy's budget standoff or renewed focus on Italy's insolvent banks - to have wide ranging and adverse consequences.